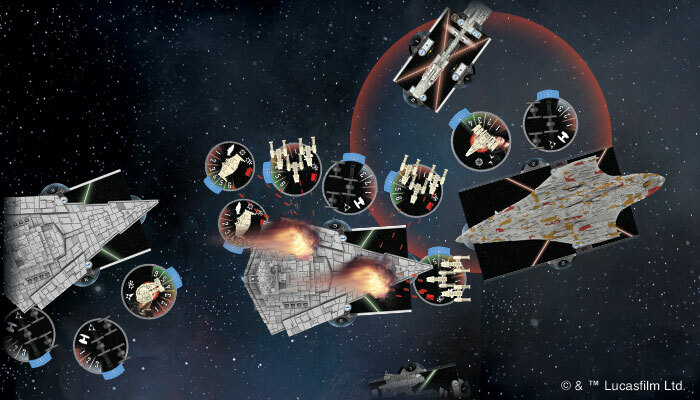 The semifinal round of the Star Wars: Armada Fleet Commander Contest has now ended. Many ships were destroyed. Many fighter pilots met their demise. 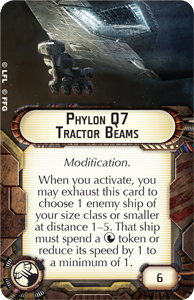 And now only two fleets remain. 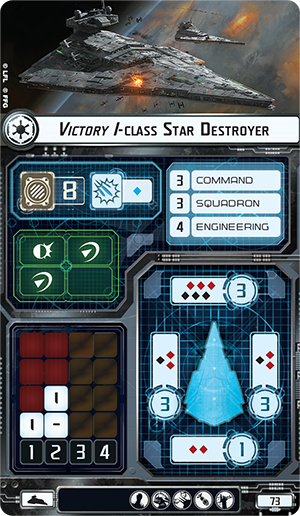 In the first semifinal, developer Max Brooke commanded Alexandra Smith's top-seeded Imperial fleet to victory against the Rebel fleet designed by Adam Pye and helmed by producer Michael Gernes. 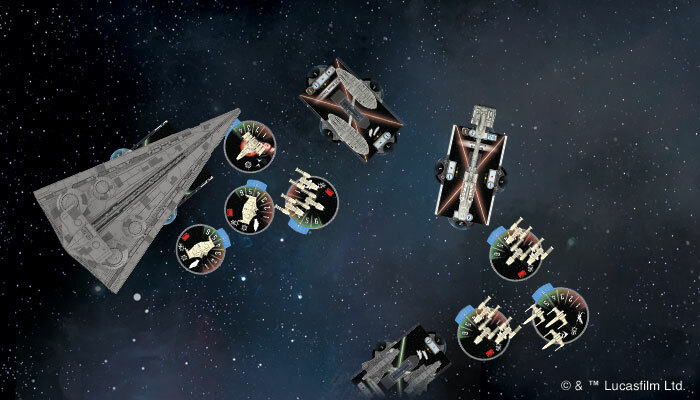 In the other match, developer Sam Stewart and Craig Lincoln’s Rebel fleet claimed a hard-fought victory over the Imperial fleet designed by James Lockwood and flown by developer Alex Davy. Our congratulations to Alexandra and Craig! Their fleets will now meet in battle during the final round of our Fleet Commander Contest. Both have earned the developers’ respect for their design, but only one will win its creator a full set of all the Armada materials needed to fly it to battle! Last week, Max and Michael both described the strategies they hoped would lead them to victory. Max intended to use his fleet's Admiral Konstantine and Phylon Q7 Tractor Beams to trap Michael's ships within the powerful forward firing arcs of its Victory I-class Star Destroyers . Michael, on the other hand, intended to use his ships primarily to support the massive collective firepower of its fighter squadrons. Michael did, however, adjust his strategy at the table in one important regard; after sizing up Max's fleet, he decided to take the initiative. 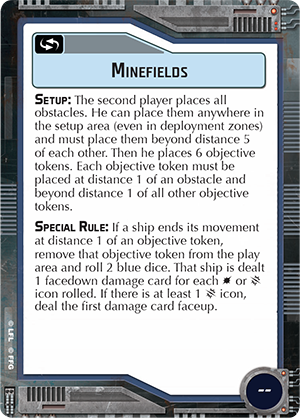 Even though Adam designed the fleet with a four-point initiative bid in order to force its opponents to play according to its objectives, Michael said, "Having initiative seemed crucial, so I chose to be first player, and picked Minefields as the least bad objective option." This served Michael well in the early game, while the deployment and initial engagements went just as he had hoped. His Rebel aces quickly punched through Max's TIE fighters, and by the end of the Round Three, his bombers had chewed through one Victory and nearly through the second. However, as he noted, "The Liberty suffered modest damage while helping Yavaris take down the first Victory, and in the process of redirecting fire from the forward hull zone, I opened up the Liberty's left hull zone." 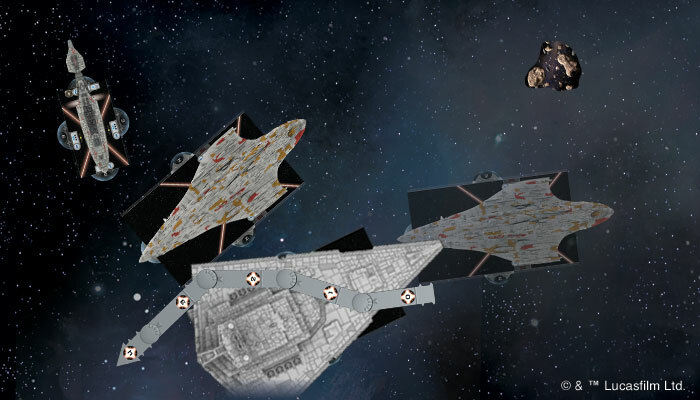 With Jan Ors assigning heavy to Max's TIE fighters, Michael's fighter squadrons and Liberty make quick work of a Victory I-class Star Destroyer. Michael had paid little attention to the flotilla Max had maneuvered into position on that side, but it landed a critical hit and dropped the Liberty's forward shields with a Projector Misaligned critical hit. Max said, "Sometimes the critical hit deck pans out, and this was one of those times." He continued, "I've never seen a game turn so quickly." 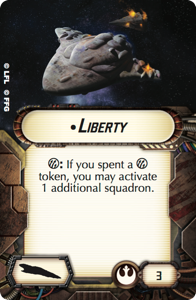 The Liberty was stripped of its shields and had the drop on the second Victory at the top of Round Four. 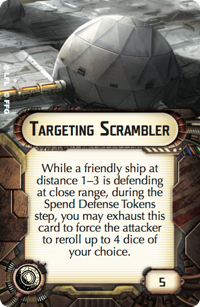 However, Max was able to use Targeting Scrambler to force a reroll and keep his Victory in the fight by the slimmest of margins. It launched its counterattack into the Liberty's unprotected hull, and then both ships collided. Michael's Yavaris then destroyed the Victory, but as it had been reduced to Speed "1," it had no way to avoid the Liberty and collided, finishing off the MC80. By this point, Max's combination of Konstantine and Tractor Beams had also reduced the speed of Michael's Yavaris and Bright Hope . Since Michael had prioritized squadron commands, his ships had no way to speed up, and they were trapped within medium range of the Interdictor , which destroyed them both. Still, the game was not yet over! Michael had until the end of the round to aim for a double-KO and very nearly succeeded. His squadrons cut through the Interdictor and started into a nearby Gozanti. But in the end, they came just shy, and Max was able to eke out the victory with two flotillas still on the table. He credits Alexandra. "Alexandra's fleet took some time to get up to speed—or rather, to get the enemy down to speed—but once Michael's fleet was in the trap, it proved unable to break out. 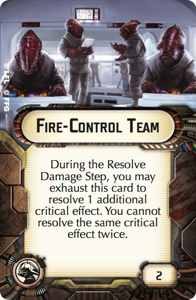 Forcing collisions proved extremely potent, and the sheer volume and variety of speed-manipulating effects kept even the really swift ships like Yavars and Bright Hope within reach in the last few rounds." 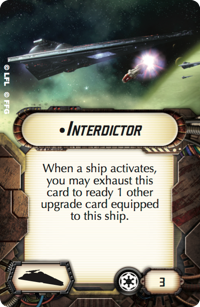 Game One MVP: The Interdictor. 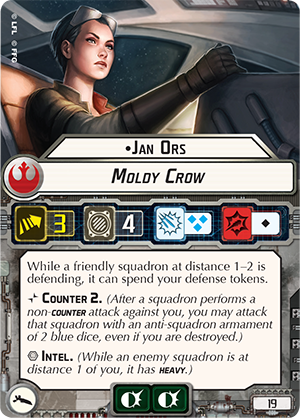 Over in the other match, Sam and Alex flew at each other with fleets designed to maximize the punch of their two hard-hitting, large-base starships, the Rebel Alliance's Mon Karren and the Imperial Navy's Devastator. With both ships capable of unleashing truly deadly volleys, it seemed destined that the battle would erupt into explosions of all varieties. 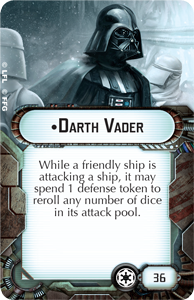 But Armada is a game about the larger battle—and minding your objectives—not just about trading body blows. Sometimes, you just need to get the better of an exchange and then regroup back with the rest of the fleet, and that is effectively what Sam was able to do with this engagement. He says, "This was an incredibly close game! My plan was to hit the Imperial line, deal as much damage as possible, and blow on through." This was in keeping with what he had previously said was his intended strategy, and it worked. "But barely," he clarified. "I ended with all of my ships heavily damaged and fleeing from a pretty-much unscathed Devastator. My MC-30c had two shields and two hull remaining. 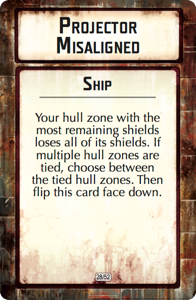 Yavaris had two hull and four shields, and the Mon Karren had been stripped all the way down to a single point of hull! "I had pulled this out by the skin of my teeth, and I have to credit the maneuverability that Craig built into the fleet. Without Crix Madine, I couldn't have pulled off the ridiculous maneuver that let me scoot Mon Karren past the Devastator, or the hard right turn that kept me on the board." These comments referenced what were very likely the turning points in the match, which was played amid the cluster of mines from the Minefields objective. After the Devastator dealt the Mon Karren a small amount of damage to its flank in Round Two, the Mon Karren was stripped of nearly all its shields and pinned against the Devastator's nose in Round Three. In the same round, Sam's MC-30c fired against one of Alex's Gozantis and triggered a double critical hit with Fire Control Team. 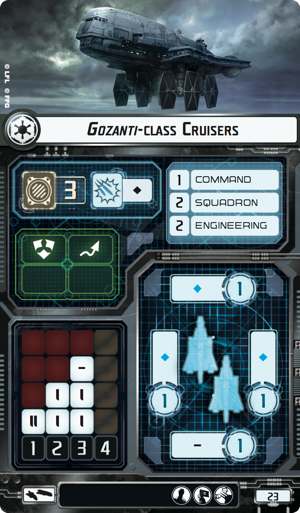 The Gozanti-class Cruisers suffered a Thruster Fissure and a Capacitor Failure, but survived… only to fly into a mine and explode. Here, Sam realized the Mon Karren needed to get out of the Devastator's forward firing arc, or be destroyed. 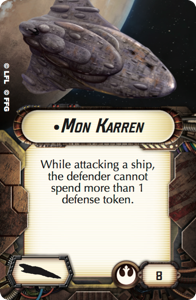 After it launched a massive volley that destroyed the other Gozanti, the Mon Karren—thanks to Madine's expertise—was able to use both a Maneuver command and Maneuver token to side-slip the Devastator and fly into the hole left by the exploded assault carrier. The Mon Karren finishes off Alex's Gozanti-class Cruisers with a devastating volley. 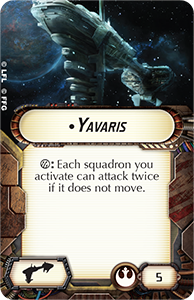 With the Gozantis out of the way, Sam maneuvers the Mon Karren just enough to slip free of the Devastator's lethal forward arc. 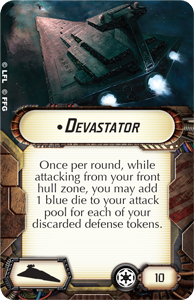 Still, Alex was able to hit the Mon Karren with a volley from the Devastator's side that left the MC80 with only a few hull points remaining. 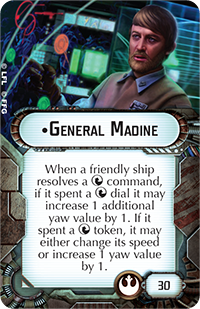 And because the Devastator no longer had a shot at the Mon Karren from its forward arc, Alex decided to take his best shot at General Madine and the Bright Hope. 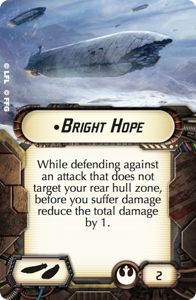 However, despite an attack of four red dice and two blue—plus the reroll afforded by Darth Vader —Alex failed to roll a single accuracy, and the Bright Hope avoided all the damage with its scatter token! Madine's survival was again immediately and directly responsible for the continued survival of the Mon Karren. 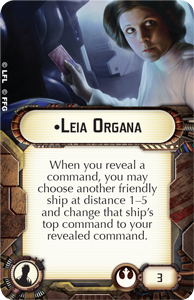 Flying at Speed "3" and veering straight toward the edge of the map, the Mon Karren would have flown off the board had it not been for Leia Organa's intervention, changing the ship's ill-timed Engineering command to a Maneuver command. With Madine, that was enough to turn the ship and keep it in the battle. Alex agreed that the game was exciting, adding, "I couldn't have asked for a closer, more exciting game. I wanted to trap Sam's fleet in a mine-strewn asteroid field, forcing his ships to flee from the awesome might of the Devastator. And the plan almost worked. 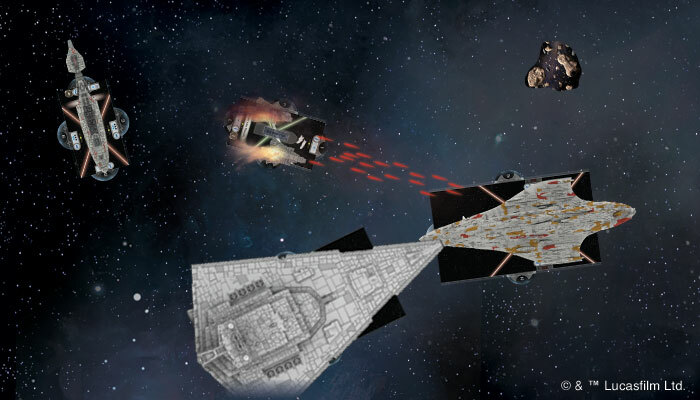 Forced to contend with both the Devastator and the Interdictor, the Mon Karren had no choice but to hit and run." He had hoped that the Force would have been a little stronger with him, but he acknowledged that Sam's strategy had a lot to do with the results. "Sam played expertly, blasting through my Gozantis to create a hole in my blockade, and pulling off a truly epic escape!" Which fleet will win the Armada Fleet Commander Contest? Will it be Alexandra’s Imperial fleet? Will it be Craig’s Rebel fleet? 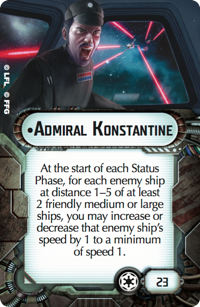 In the end, only one fleet will emerge victorious, and to the victor go the spoils—all the Star Wars: Armada materials necessary to build the fleet! Check back next week to see whose fleet takes the ultimate victory and to see what role the Wave III and IV ships play in the final match. In the meantime, be sure to head to your local retailer and pre-order your Wave III and IV ships today!